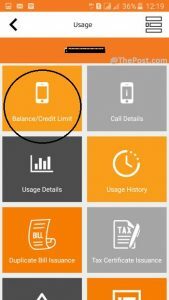 Home/Telecom/Ufone Balance Check Code – How to Check Balance right now? There are various telecom companies operating in Pakistan. Ufone is one of them. 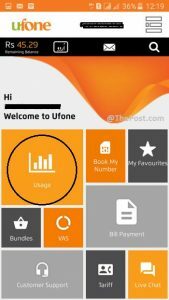 If you are a newbie in Ufone family, you may be ignorant of all of its call packages, internet packages and SMS bundles, etc. You will surely be unknown to the balance check code of Ufone too. Here, I am going to explain how you can check your remaining balance on Ufone. I am explaining here two different methods of balance check. You can use the one convenient for you. 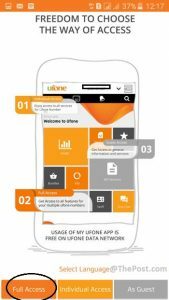 Only a few users may be using the Ufone app. The majority of the people do not use it and they want an alternative way to check the balance. Well! You can check the balance by using a shortcode. Just go to the phone book and dial *124# to check the remaining balance. Wait for a few seconds and it will show you the remaining account balance on the screen. Every time you check the balance by using this shortcode, the company deducts 0.15 Rs from your account. You can check balance by using Ufone app. It is available on Google Play Store. If you are using Ufone app, you do not need to use any code for checking the balance or for subscribing to any bundle. It has all of the functions. You just need a login ID and password to use the app. Here is how you can check balance by using Ufone app. First, launch the app on your mobile phone. If you are a new user, signup is required by using your Ufone number, ID card/passport number, your name, email and password. Now, you can log in to the account by using your email and password. Here, you will see the Home page. Tap “Full Access” at the bottom to access all of its features. On the next page, you will see all of its important features. You need to tap “Usage” as shown in the image below. Here, you will see different options including call usage details, internet usage details and balance/credit usage details. You need to select “Blanace/Credit Limit” at the top of the options. 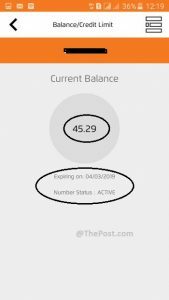 As you tap the option, within a few seconds you will see the remaining balance of your Ufone account with the expiry date. 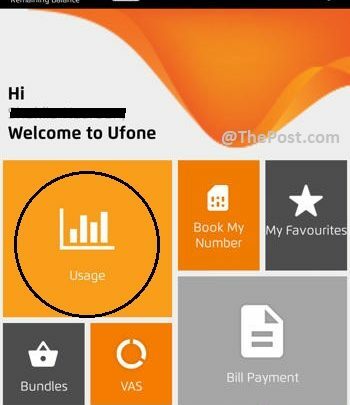 It also provides you with the information regarding the Ufone number whether recently it is active or not. It is for all Ufone prepaid users irrespective of the package/bundle they are using recently. The standard charges apply to every time you check the balance.